This coming Thursday is Valentine’s Day: 24-hours devoted to romantic love, the giving of roses and chocolates. And oh yes, a lot of commercial huckstering. Historically, and most ironically, Valentine’s Day has roots in Christian martyrdom. It also has links to massacres: the notorious St. Valentine’s Day Massacre of 1929 easily comes to mind. Although the historic link between passion and martyrdom may be difficult to limn, it does have a place in modern times. In modern times, St. Valentine’s Day is associated with the city of Chicago and the names Capone, Moran and O’Banion (that’s the 1929 “St. Valentine’s Day Massacre” at the SMC Cartage Co. garage), and the 2018 mass murder at the Marjorie Stoneman Douglas High School in Parkland, Florida, in which 17 students and staff members were gunned down, and an additional 17 injured by one person armed with an AR-15 style semi-automatic rifle and multiple magazines. In the year since this utterly horrific event took place, the world has changed - not only for the students, faculty and families of Marjorie Stoneman Douglas (MSD) but for anyone and everyone who cares about gun violence in America. Survivors like David Hogg, Cameron Kasky and Emma Gonzalez have become leaders of a national movement called “March For Our Lives,” spoken at Harvard and helped galvanize a nation. They have also been accused of being homosexuals, paid actors and stooges for “gun-hating ultra-leftists.” Throughout it all, they have put their collective trauma to good use, often acting with greater energy, reason and maturity than those who insist that arming teachers and administrators is the answer . . . not gun safety measures. Less than a month after the MSD massacre, the Florida Legislature did pass a bill which raised the minimum age to buy rifles and shotguns to 21; extended a three-day waiting period for handgun purchases to include long guns, and banned bump stocks that transform guns into automatic weapons. While many applauded this action on the part of the historically “whatever the National Rifle Association (NR) wants is fine with us” state legislature, some thought even this went too far. This crowd fears that any legislation is but a first step toward gutting the 2nd Amendment right to bear arms; that soon, there will come a knock on the door and the total confiscation of all weapons. On the other side of the gun safety issue, there have been calls to ban assault-style weapons - a law did exist in the United States from 1994-2004. Depending on whose statistics one accepts, the decade in which the ban was in place was either successful in lessening mass shootings or made virtually no difference. Ever since 2004 - when the law was cancelled - there have been renewed calls for a new weapons ban . . . one without a time limit. These calls have come, most understandably shortly after mass murders like the ones at Sandy Hook, Orlando, Las Vegas, Parkland and now Pittsburgh. Polls on the issue of banning assault-style weapons are inconclusive. While NPR reports that after Parkland, nearly three-quarters of those polled favored such a ban, U.S. News cited a Gallup poll which claimed that a majority were against such a ban. People are frustrated, angry and feeling powerless to affect change. It has long been my belief that when people find they are fighting a losing cause against the legislature, it’s time to go back to the basics . . . changing the Constitution. As near impossible as this is on a federal level (our Constitution has been amended a mere 27 times, with 10 of those amendments being enacted on the same day [December 15, 1791] and 1 amendment [the 21st] being enacted to repeal another ). However, it is actually doable on a state level. How is this possible? Well, in the case of state constitutions, petitions can replace politicians. Here in Florida, parents, students, teachers, everyday citizens and like-minded politicians have been beating the bushes, getting signatures on petitions which, if successful, will place a new constitutional amendment on the 2020 ballot. In brief, the amendment would prohibit possession of assault weapons, defined as semi-automatic rifles and shotguns capable of holding more than 10 rounds of ammunition at once, either in a fixed or detachable magazine, or any other ammunition-feeding device. Possession of handguns is not prohibited. The petition also says that military and law enforcement personnel are exempt in their official duties, and exempts and requires registration of assault weapons lawfully possessed prior to this provision’s effective date and creates criminal penalties for violations. 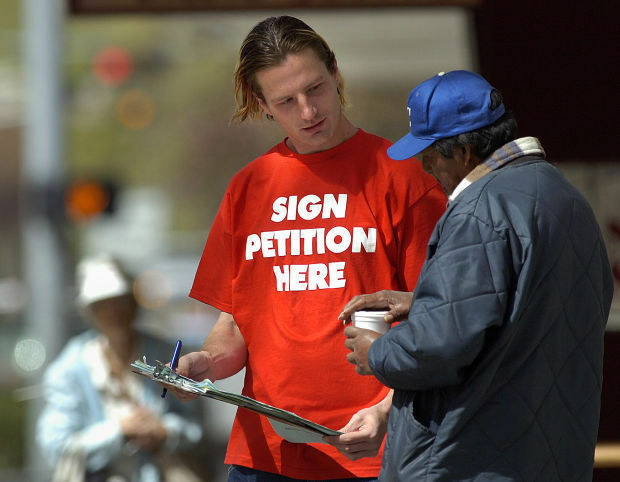 In order to get on the 2020 ballot it will require 776,200 signed and certified petitions by the end of 2019. Organizers plan on gathering a minimum of 1.1 million petitions in case some signatures don’t match those on 2016 ballots and are tossed out by the various county supervisor of elections offices. So far, nearly 90,000 petitions have been signed and are awaiting delivery to the various supervisors’ offices. The pro-gun, anti any kind of gun safety legislation crowd is taking this petition drive quite seriously. Marion Hammer, the Florida lobbyist for the NRA said of the proposed law: This petition seeks to ban practically every rifle and shotgun in America today with the exception of single-shot bolt action rifles or single-shot shotguns by calling them assault weapons. It is a blatant attempt to fool Floridians by sucking them into a deception that would effectively ban most hunting, target shooting, and significant home defense as well. To my way of thinking, this is a blatant misstatement of the petition’s intent, and falls back on NRA surrealism . . . such as The only thing which will stop a bad guy with a gun is a good guy with a gun and Guns don’t kill people; people kill people. This kind of surrealism must be challenged. For anyone who wishes to sign the petition, go to Ban Assault Weapons NOW (BAWN); then click and download the link that says “petition” near the upper right-hand corner. If you’re not a Florida resident, you can also help by going to the and clicking “Donate.” Running a state-wide petition drive does take money . . .
Just remember this: politicians and PACS cannot kill dreams, if only the populace will sign petitions! 630 days until the next election . . .